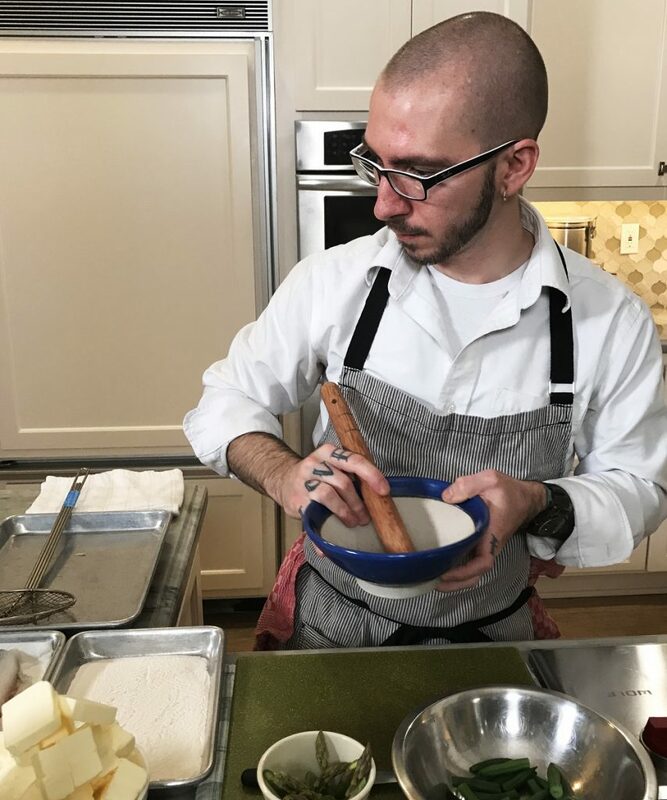 Zachary Geerson, executive chef at Journeyman’s Food + Drink in Fullerton, Orange Coast Magazine’s 2019 Restaurant of the Year, uses his talent to create dishes that are innovative and irresistible. With a firm footing in classic techniques mastered at The Culinary Institute of America at Hyde Park, New York, he showcases alluring twists that bump up flavor and provide stunning presentations. He describes Journeyman’s cuisine as “progressive American,” with progressive defined as what is coming up next, not in terms of flighty trends but what is right for the restaurant. “For example, in 2018, fermentation took a huge step forward,” he explained. “Chefs started focusing on that. We jumped on that train, but we tried to use it in a way that spoke the language of what we wanted to be. When asked about molecular touches that he recently concocted, he spoke about a powder that he made from dehydrated pickled strawberries. It was used as a seasoning dust on an umeboshi-style green lollipop. In my home kitchen, he prepared pan-roasted branzino fillets accompanied with sides and sauce reflecting a classic French point of view. The vegetables, blanched-until-tender-crisp asparagus and green beans, were tossed with a lemony vinaigrette. 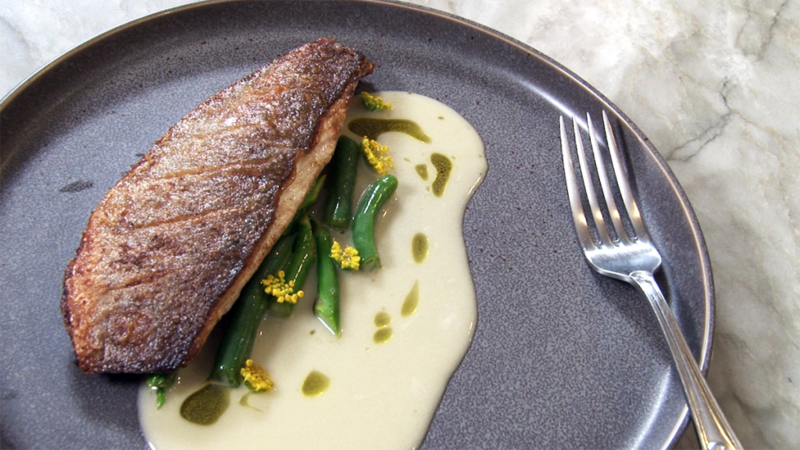 A thyme-infused beurre blanc complimented that crisp-coated fish, giving it a luxurious oomph; he strategized that the white butter sauce could be partially made in advance. Asked how he might change the dish for restaurant service rather than a home-style approach, he said that one option would be to skin the branzino fillets and season the belly side of the fish with salt, lemon zest, thyme, and fennel pollen; the fillets would be sandwiched in different directions head to tail and enclosed in plastic wrap. Poached quickly, they would be almost like a branzino torchon. The skin would be baked between two silicone mats to be crispy like a fish-skin tuille. Asparagus would be used to create three textures; an asparagus flan, a beautiful asparagus bisque, plus a salad of shaved raw asparagus (jumbo size are used for shaved curls). Instead of beurre blanc straight-up, they would do a milk infusion flavored with unusable ends of the asparagus. With a foaming agent, he would create a little foam, so the plating would be reminiscent of seaside foam. An artist’s vision plays a part on the plate, balanced with steadfast culinary skills. His passion for cooking shines. Read the tattooed truth on his fingers; one direction it’s “food love,” the other reads “love food.” Indeed. 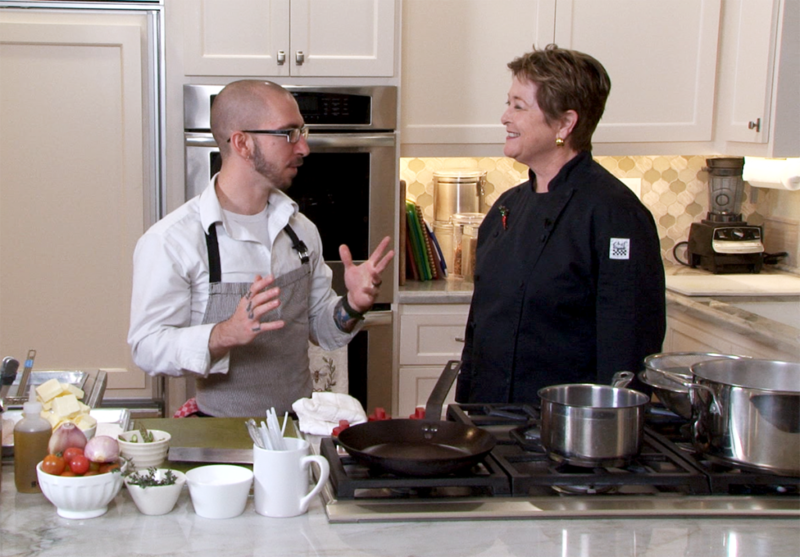 Kitchen Music: Geerson says that music played in the kitchen is very freeing. He has the staff play music whether it’s their own or something he picks. He likes to listen to tenor Andrea Bocelli, or compositions from Mozart or Bach. The blues styling of guitarist Joe Bonamassa make him feel every note. The staff feeds off chef’s joyful vibe. Drink of Choice: A classic Martinez Cocktail – Old Tom gin, sweet vermouth, Luxardo Maraschino Liqueur, orange bitters. Stirred and served neat. Artistic Dance Man: Before he was a chef, he was a breakdance and hip-hop instructor for adults and children in Fort Myers, Florida. At 8 or 9, he learned by watching videos on TV. In those early years, he also shined at drawing and watercolor painting, plus found time to sing in the church choir. Mentor: Early in his career, he worked in Florida with Chef Harold Balink, the owner of Cru, an American-French restaurant. Balink, very tall and intimidating, was consistently calm. He sat down Geerson and told him he had two weeks to prove himself, then started dictating recipes from his head. The image that stays with him was the recipe for Blueberry Goat Cheese Cheesecake pulled spontaneously from the chef’s noggin, where all his recipes resided. He still makes versions of that dessert. Dream Project: A 20-seat no-menu restaurant cooking with his wife Olivia. His reputation would instill trust and guests would allow the kitchen to cook what they thought was best. They would live above the restaurant. Journeyman’s Food and Drink is at 1221 E. Burton St., Fullerton. See the menu at journeymanfood.com. Start by preparing beurre blanc sauce reduction. That part of the sauce can be prepared in advance, then finished with the addition of butter right before serving (see Step 4). In medium-large saucepan, add shallots, thyme, pepper, white wine and vinegar. Bring to simmer; simmer until “au sec” – almost dry, maybe 1 tablespoon of liquid left. Remove from heat and set aside. Cook vegetables in rapidly boiling salted water until tender-crisp. Meanwhile, prepare vinaigrette, mixing vinegar or lemon juice with salt and pepper. Whisk in oil in thin steam. Prepare branzino: Dust fish lightly with Wondra flour. Season with salt, fennel pollen (if using) and Espellete pepper (if using). Heat skillet on medium heat. Add generous amount of butter; heat butter until foaming subsides and butter turns a light golden brown (this caramelizes the milk sugars in the butter and lends a nice toasted-nut flavor note). Place fish skin-side down in skillet away from you. Gently press the fish down flat with the flat side of a fish spatula or small offset spatula for roughly 10-15 seconds. Allow the fish to cook in the pan about 2-3 minutes or until you notice the edge of the fillets turning a delicious golden brown. Check the fillet’s skin side for even color, and if it is nicely golden brown all over, flip fillets and turn off the heat under the pan. (At this point, chef likes to add a few knobs of chilled butter to the pan with some fresh thyme; this will help the pan cool down faster and imparts more delicious flavor.) Place fillets on small warm tray lined with paper towels. Plating: Toss vegetables with just enough vinaigrette to lightly coat. Divide vegetables between two dinner plates, placing them in a mound. Top with fish. Spoon beurre blanc to one side and serve.